Liz and I often agree on movies, but there are occasions where we do not, and Irrational Man is one of them. As it rolls out to theaters across the country, starting with this weekend, we thought you might like to read two different opinions. Enjoy! 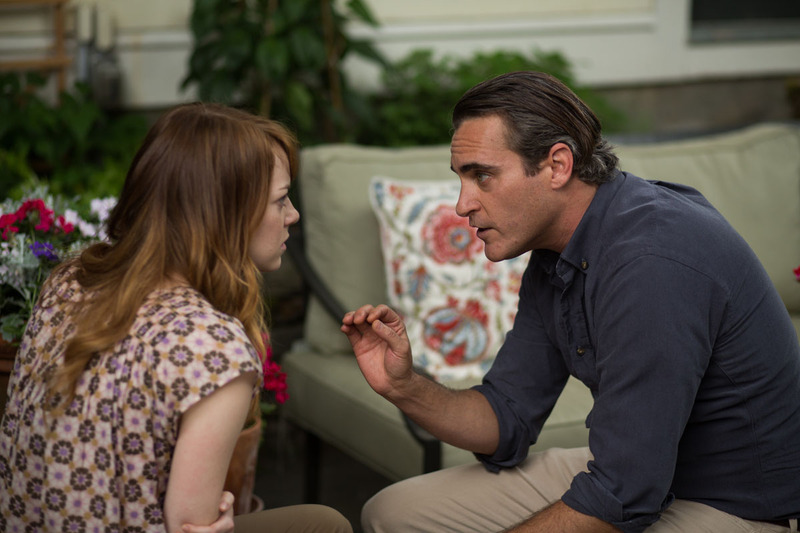 Looking through the stills of Irrational Man, I almost remember it fondly. Seeing these characters without the context of the movie, they are attractive and happy. Within the movie, Joaquin is a bitter, drunk college professor with some sort of social disorder and a Emma is a student who falls in love with her teacher. So what’s it about? Abe (Joaquin Phoenix) is the new philosophy professor whose cynical yet brilliant ideas attract a student, Jill (Emma Stone) as well as a colleague, Rita (Parker Posey). Ok, another example of a young woman attracted to an older man. But wait, is it? I’m typically a Woody Allen fan, but I didn’t care for the last movie with Emma Stone, Magic in the Moonlight, either. In this, Emma is way too eager and without a likeable personality. She knows she’s a silly girl, yet she doesn’t shy away from it. Parker Posey is even more manic than expected and it actually works pretty well. She’s a bright spot. Joaquin seems totally miscast and never really gets into the role. His words don’t seem natural at all and come off as though he’s adding words on his own. It kills me, as I’ve loved everything he’s been in. The story is pretty original however, with unexpected turns, especially the ending. As per usual with a Woody Allen movie, it’s beautifully shot and edited. The soundtrack is unbelievably repetitive, with the same piano version of “Judy In Disguise” playing over and over again in pretty much every scene. I had never noticed this in Allen’s movies before, but I certainly noticed it this time around. On the flip side of the coin, I found this film to be pretty delightful. There is no mistaking this is pure Woody Allen fare. Punctuated by loose jazz standards, quippy, fast-paced dialogue, including dairy-esque monologues moving the film’s plot along nicely. It’s not too far fetched that one overheard conversation can change the course of your life forever, but certainly for amusing and dramatic purposes, this one is pretty over the top. The plot also revolves heavily around the concentration of philosophy, which is the subject Joaquin’s character teaches. One of the best tongue in cheek lines is a direct quote from his portrayal of Abe, ” Philosophy is verbal masturbation.” This is kind of the perfect way to describe Allen’s writing style in general and I think you either gravitate towards it, or you don’t. I was certainly pleased with all the performances in the film. Emma Stone‘s Jill is eager, bright, yet her flippant idolatry for her professor is not so far fetched. It’s a strong performance she owns with ease. Phoenix, for me, was perfectly cast as Abe. His jaded, depression filled, existential crisis excuses are anything but boring. It was refreshing to see him in something with a biting sense of humor as far as the script is concerned. And then we have my girl, Parker Posey as Rita. I’ve been a huge fan since her Waiting For Guffman and House of Yes days. She has an uncanny ability to slip into whatever role is thrown at her. Her genuine nonchalance as a bored fellow professor is just the best. Being of the same age and stage as Abe gives the two a breezy interaction that allows Posey to shine as a real person. Not a caricature of a woman, but a really well written woman, with hopes, dreams, opinions, unafraid and yet still completely vulnerable. I would have watched a full film about Rita. So, there you go movie fans. Two Woody Allen fans with two very different opinions of the same film. I guess you’ll just have to buy a ticket and find out for yourself. Irrational Man opens in theaters this weekend opening in more theaters throughout the coming weeks. This entry was posted in Go To The Movies, in theaters, Liz, Melissa, News, Poster, Release, Reviews, Trailer, What To Watch This Week, Woman Lead, Women in Film and tagged emma stone, house of yes, Irrational Man, joaquin phoenix, magic in the moonlight, Parker Posey, Waiting For Guffman, woody allen by Melissa Hanson. Bookmark the permalink. Brackets	Battle of The Actors Round 2 Match-Ups!